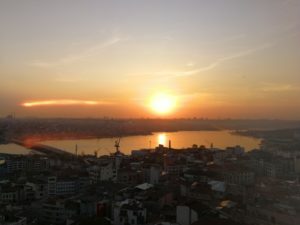 My wife, Ntando, and I were up at the crack of dawn to catch our early morning flight to Istanbul Atatürk Airport from Doha, and as you will soon discover, our only regret is that the trip ended too soon. 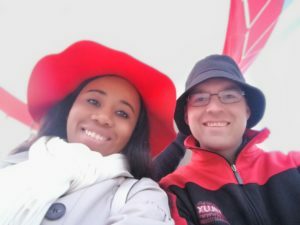 I prefer to have a tour guide on trips when we are visiting countries where English is not widely spoken or the locals speak it in a very limited way. That does not stop Ntando and I from exploring for ourselves but we generally like to get the key information and assistance from a guide in the day and then go out and explore for ourselves in the late afternoon into the evening. Our guide’s name on this trip was Ezgi Tubay Uludağ. If you are on your way to Turkey, Ezgi comes with our highest recommendation. She was absolutely superb. Every time we made requests outside of the itinerary she went out of her way to accommodate and/or make additional suggestions. 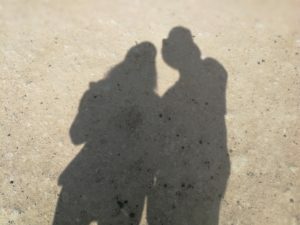 Ezgi’s friendliness was however in contrast to what we encountered from the average Turk. We found them to be fairly rude people. If you are walking through Istanbul, do not take any offence at being bumped in all directions by locals walking past you. This is as normal as brushing your teeth. That said, not all Turks are like this. 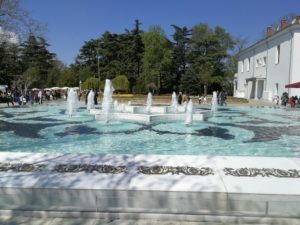 On our trip to the Sultanahmet area, which included tours of the mosque, hippodrome, Topkapi Palace and the Blue Mosque (which sadly was closed for renovations) we encountered several school children on an excursion. Recognising us instantly as visitors to their country, we were greeted with several shouts of “Hello!” It was very cute to say the least. Something else that was even better than cute were the tulips all over Istanbul. As it turned out it was tulip season in Istanbul, not that we planned our trip around it but it did provide us with several opportunities to marvel at these beautiful flowers along Taksim Square and Emirgan Korusu. 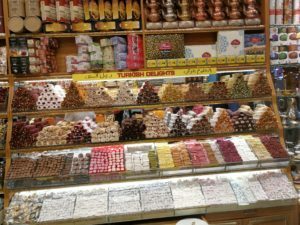 We visited the famous Grand Bazaar early on our trip and I am glad we did. It was there that I found the most delicious Turkish Delight. Many years ago in South Africa there was a chocolate bar called Turkish Delight and it really was anything but delightful. I hated the taste of it. Now decades later I was in Turkey and tasting something that was completely different and just plain delicious. I bought a full box of various flavours and snacked on it liberally throughout the remainder of our trip. The Spice Bazaar is a smaller version of the Grand Bazaar – both are nice and if you prefer a busier spot with more options, go Grand, otherwise Spice will suffice. Ntando lamented the lack of vegetables that were served with typical Turkish dishes, or indeed typical dishes served at any restaurant for that matter. I had no issues as I am not a fan of vegetables at all and generally avoid them. On the cuisine front I was keen to try it all out as far as I could. 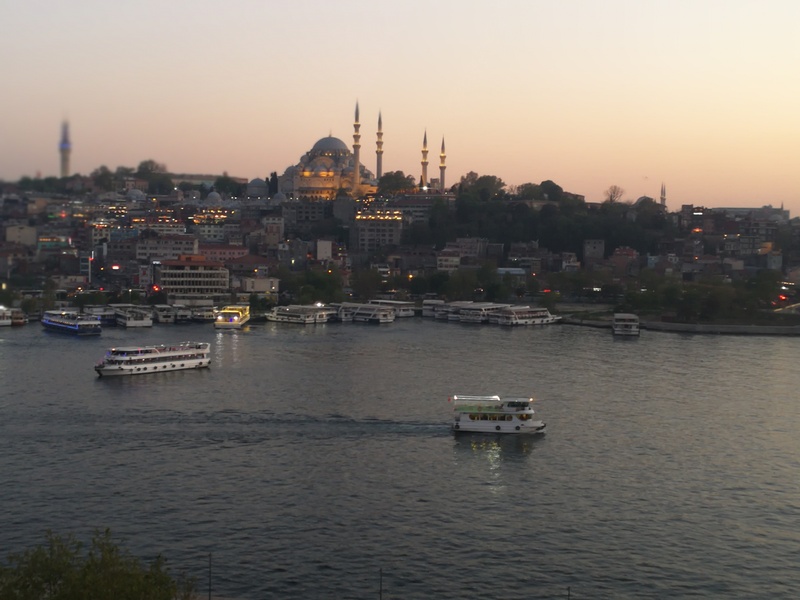 We found ourselves at Eminönü a few times as we went on a few boat trips along the Bosporus. It’s a cheap trip at just ₺15 for a trip that lasts around 90 minutes. At Eminönü I bought a Balık ekmek, a fried fish and lettuce inside a large bun. I think we can call it comfort street food. I didn’t mind the Balık ekmek or the simits (basically the Turkish version of a pretzel) but I preferred the Kumpir, which is a baked potato stuffed with pretty much whatever you want! I chose cheese, viennas, mushrooms and yoghurt. I would say there is easily enough food there for two people but hey, I was on holiday and who cares if you’re eating a heart attack wrapped in foil? But by far the best restaurant we visited in my opinion was Nişantaşı Başköşe and if you get the chance I highly recommend it. The service was excellent and the food even better. I selected the Yoğurtlu Başköşe Kebap and immediately announced afterwards to Ntando that it was in the top five dishes I had ever devoured. Yoğurtlu Başköşe Kebap is chunks of lamb fillet and the restaurant’s signature lamb kebab on a bed of house bread and yoghurt topped with their special sauce. Special is an understatement of note. Kudos also to my wife who used her instinctive inspector skills and discovered these top restaurants that we dined at. The hearty stuff was good but as you may have picked up after my Turkish Delight paragraph, I have a sweet tooth and Turkey does not disappoint on this front. On the first night I had Künefe, a cheesy, pastry hot pudding with pistachios on top. This is something I am sure they serve in Heaven. I also indulged in Tavuk göğsü, a doughy baked creamy vanilla pie with chicken meat inside. Chicken for dessert? You better believe it. Thanks to this trip, I now rate Turkish ice-cream as my favourite. It’s gooier than regular ice-cream and I just love it. Mado became my franchise of choice with the pistachio flavour elevated all the way up to my second-favourite flavour of ice-cream after blueberry. 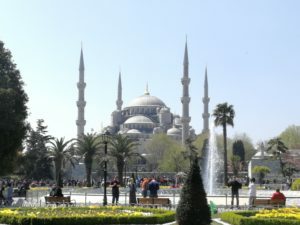 During our trip we also visited mosques, museums and monuments that included Dolmabahçe Palace, Hagia Sophia, Ortaköy, Pierre Lotti, Princes’ Islands and the Golden Horn. There really is a photo opportunity at every stop and apart from the glorious panoramic views of Istanbul each of these presented, we also had a chance to take happy snaps of, and from, the Bosphorus as well as the beautiful mosaics and frescoes on display in the mosques and museums; many dating back to Biblical times. We even saw the gold-plated arm of John The Baptist. The two best views in our opinion are from The Peninsula Restaurant that overlooks the Bosphorus and from up top the Galata Tower. 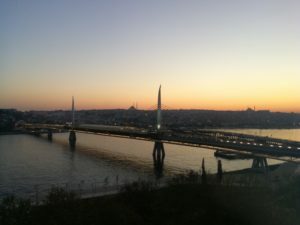 Ntando managed to capture a spectacular time lapse of the Istanbul sunset from the former. When you’re done at the Galata Tower, I highly recommend you trot a couple of blocks down the road to Viyana Kahvesi and help yourself to the best hot chocolate in the world. Thanks to our excellent tour guide, Ezgi, there was very little need to learn any Turkish but we still managed to say “Merhaba” (Hello) and “teşekkür ederim” (Thank you) a few times, especially to our Uber drivers, who usually travel in large black Mercedes-Benz vans that can seat at least six passengers. The country itself is fairly well off but it is not without its economic challenges. A typical walk down the street will almost certainly include an encounter with a beggar; these are usually Syrian and they can be quite persistent. We felt sorry for all of them and gave a few lira to some of them, especially the children. We absolutely loved our time in Istanbul and it is ends up placing extremely high on my overall list of favourite destinations, but it was time to depart the only city in the world that spans two continents as we boarded a lunchtime flight to Kayseri, a city in Anatolia. From the airport we were whisked away to Göreme and checked in to our hotel, a cave hotel no less. 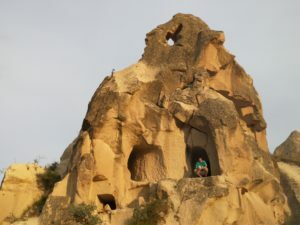 Situated in Cappadocia, the landscape is made up of unique caves and tall vertical rock structures that have been formed over centuries, and indeed millennia, with volcanic eruption, lava and erosion from wind. 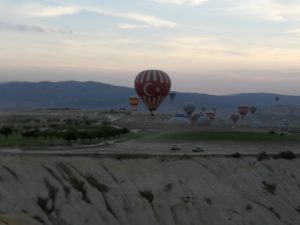 Before going for a tour of this amazing landscape, something equally wonderful was on the list – a hot air balloon ride. 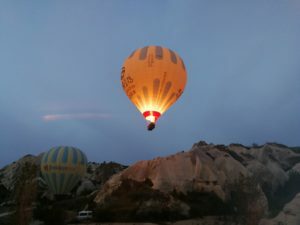 We spent about 45 minutes up in the air overlooking the vast and unique Cappadocia landscape and took many pictures and recorded several videos of our views from up in the sky, not only of the landscape itself, but also of our fellow hot air ballooners. There were easily 50 other balloons up in the sky at the same time. What a view and what an experience! Another thing we noticed about Turkey is that most of the people tended to be trim and slim. This was no doubt due to them doing a lot of walking to and from the various public transport hubs on their way home or to work. Turks also smoke a lot and I mean, a lot. So much so that in Italy, among other countries, there is even a phrase, “Smoke like a Turk”, that is given to anyone who smokes excessively. The citizens themselves disguise this by announcing that they are going for “Turkish time”. At first we thought this could be something similar to African Time but as it turned out, that is the euphemistic way of saying they are off to have a puff. Uğur Yıldız is a smoker. He is also the colourful and animated man who would be our tour guide in Capadoccia for the day after our hot air balloon adventure. It began with the panoramic views of the Devrent Imagination Valley, which I quite enjoyed since it is an area where early Christians hid from persecution and in the distance is the area where the Hittites inhabited. Earlier I spoke of the large, vertical rock structures – they are also known as the fairy chimneys and they dominate Paşabağ. I would not necessarily describe it as beautiful but it is certainly unique and something to marvel at. At Avanos we visited a ceramic pottery where Ntando had the fun experience of moulding a pot. A stop at Uçhisar after lunch was where we had the joy of viewing the rock castles and caves where the Christians used to live and even built churches. Inside these caves are several ancient paintings that can still be seen. 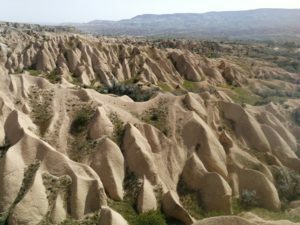 From there it was off to Esentepe for similar cave and rock structures that just go on for days. We finished off at a similar spot, the Göreme Open Air museum. Ntando also found time to climb a horse and in my zeal to get a good video of her on the horse I took my eye off the terrain and twisted my foot in a ditch and took a tumble to the ground. No bones or cameras were broken! In the end it was a memorable trip that will long live in memories in a very fond manner. 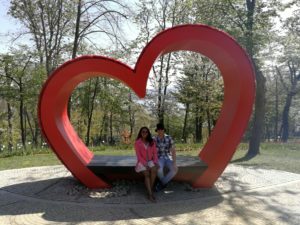 We loved our trip to Turkey and have no doubt you would enjoy it too. Take a trip to Turkey. You will be delighted you did.